Sieglinde is a beautiful 19th century vaulted ceiling apartment, only few steps away from the historical center of Lecce, a Baroque art jewel in Apulia. The apartment boasts three bedrooms and two bathrooms (one with bath-tub and the smallest one is with shower) and it can welcome six (6) guests. 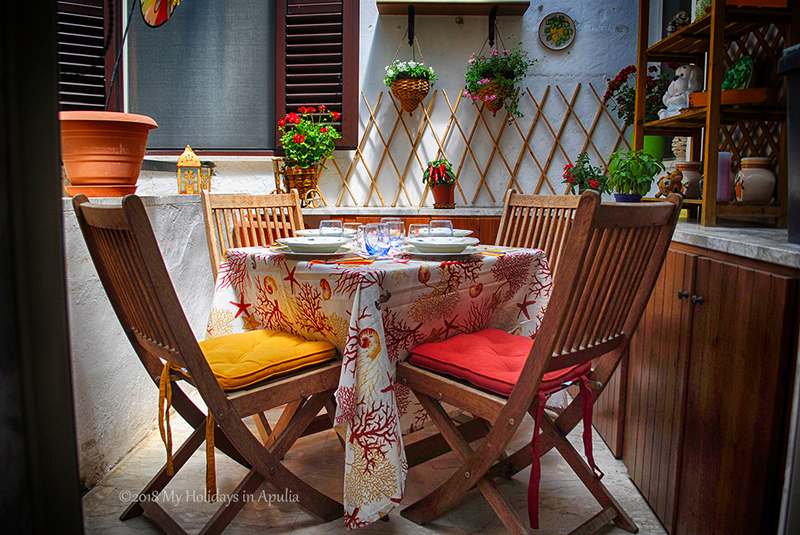 Next to a full catered kitchen, a small terrace in the court is the ideal place, where to enjoy meals and relax. A fire- place in one of the sitting rooms invites to fabulous BBQs. The apartment has free WiFi internet and free parking on the street. In Springtime, to rent Sieglinde apartment is € 90 per night (€ 630 for one week). The price is inclusive (gas, water). Weekly change of bed linen and towels + cleaning at the end of the stay cost € 80. It is possible to rent Sieglinde apartment for no less than four nights up to 28 nights. In July and August, the total cost for renting Sieglinde apartment is € 140 per night (€ 980 for one week stay). In Autumn and during Winter months, the cost is € 90 per night (€ 630 for one week stay).